Despite the fact that platforms such as Facebook and Twitter have come under fire this year for allowing bots and fake profiles to spread false information and sow hatred and division, social media advertising continues to grow in the United States. 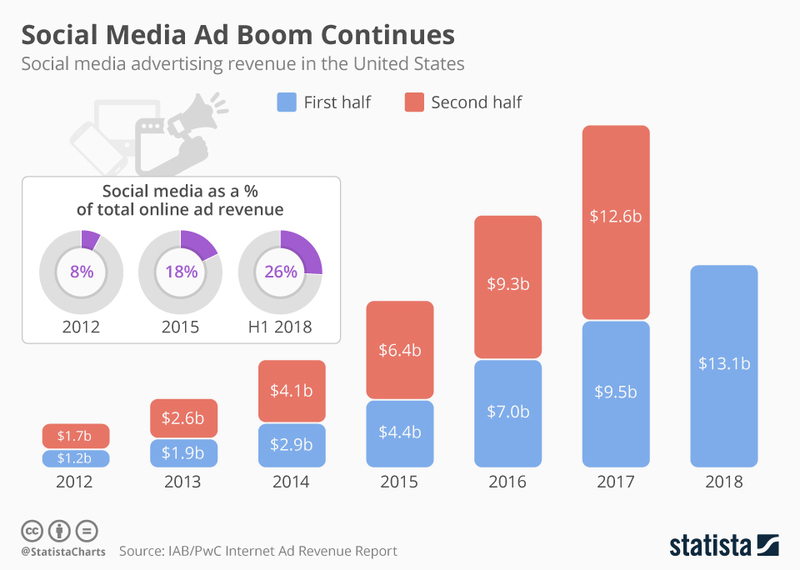 According to IAB’s latest Internet Advertising Revenue Report, social media ad revenue in the U.S. amounted to $13.1 billion in the first six months of 2018, up 38 percent from the first half of 2017. Social media advertising now accounts for 26 percent of total internet advertising revenue, a sharp increase over its 8 percent share in 2012. Source: Statista / Felix Richter.